Modern concept art is created through digital painting software and this requires a good tablet. If you want to do concept art then you’ll want a big screen with plenty of space to get into the details of your artwork. There are many options but for concept artists I recommend the Ugee UG-2150 which measures almost two feet wide and close to 20″ tall. This is definitely a big tablet and almost all of that space is given to the screen. It uses a beautiful IPS LED display with 1080p resolution. And it comes with a display stand which can be adjusted to change the tilt from almost completely flat up to about 85° or more. The UG-2150 should work well for all concept artists from beginners to professionals. But it’s not your only option. In this guide I’ll cover the absolute best tablets that work well for concept art and all forms of digital painting. Whether you create characters, environments, creatures, props or whatever else, I guarantee you’ll find a fantastic tablet that works for you. Note: If you’re a complete beginner please take a look at our guide for beginner’s tablets first. That post is better for artists who have no experience working digitally and just need a great novice tablet to get started. But if you’re more of a semi-experienced artist who wants to paint professional concept art then this list is for you. The best tablet for concept art is a display tablet. This works like a touchscreen monitor that can mirror your computer’s screen, or it can operate as a secondary screen. Great concept art has a notable attention to the details. This comes from an artist’s years of experience but also from zooming into the smaller areas of a digital painting. That’s why larger displays are preferable for concept art. But these two features are not mandatory and you can find some great non-display tablets too. It helps if you already know some of the features you want in a tablet. How big should it be? Do you have room on your desk? Or do you want a tablet that’s more portable to work with your laptop? You can find plenty of affordable display tablets and many expensive non-display tablets. There’s a big spectrum to go through which is what makes the decision process so hard. Before going forward do a quick measurement of your desk. If you had a tablet where would it go? How much space would it need? After you finish painting would you leave it out or tuck it away somewhere? The answers will be different for everyone so these questions are not easy. But I’ll share reviews for the top 10 best tablets made for concept artists and hopefully these reviews can edge you in the right direction. For concept art I recommend getting a larger display tablet made for desktops. These larger displays are easier to work on since they feel like real monitors. And they let you get into the details with your paintings. I’ve covered only the best tablets here using many different styles & sizes. So take a look and see what you think! 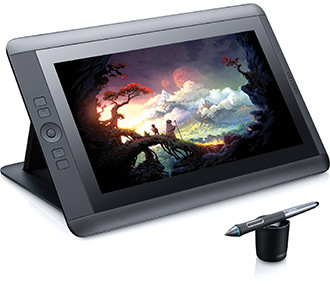 Based on the great price and the brilliant display I have to elect the Ugee UG-2150 as the best tablet for concept artists. Everything that you get for this price is phenomenal and this tablet will last for years of consistent use. Right away you’ll notice this is a big unit. It’s definitely a desk-only tablet since you won’t want to lug around a 20 lb tablet screen anywhere. But it’s also huge measuring almost two feet in length. Thankfully the display takes up the majority of the tablet which makes drawing a breeze. The screen is tuned well for digital painting with 5080 LPI resolution and 2048 levels of pressure sensitivity(all great specs). This runs on DC power so it does need to be positioned near an outlet. But if it’s on your computer desk then it can likely plug into the same outlet or power strip. It also offers many different inputs for video including VGA, DVI, and HDMI. Perhaps the best aspect of the UG-2150 is the display functionality. It never really gets hot even after hours of use. And the display settings can be adjusted with little buttons in the bottom-right corner. The display is really what sells any great tablet. And this is one hell of a display which makes it perfect for detailed digital artwork. And Ugee includes a bunch of freebies like a cleaning cloth & cleaning brush along with an antistatic glove to keep the screen free of smudges. The manufacturers really went above & beyond with this tablet so if you have room on your desk I think you’ll be pleased. Bottom Line: You get so much with this tablet that it seems insane. The price tag is super reasonable and the display is crystal clear. Unfortunately it is pretty heavy and it uses rechargeable pens which means you’ll need to charge them every so often. But if you can overlook these things then the UG-2150 is a great tablet for all concept art work. 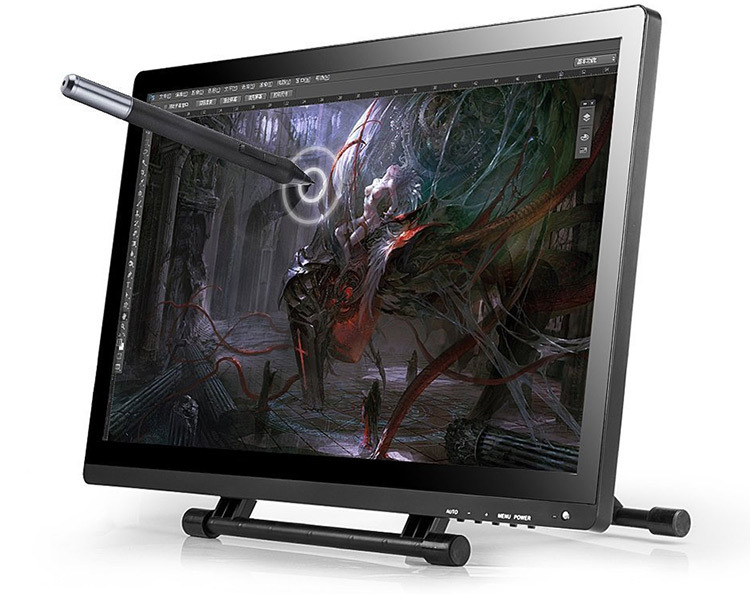 A very close 2nd pick for the best concept art tablet is the Wacom Cintiq 22HD. 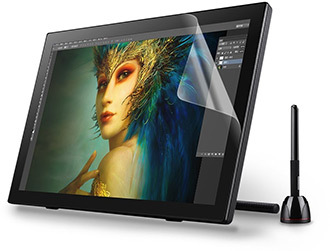 It’s the priciest tablet in this guide but Wacom is trusted by all industries from video game companies to animation studios. 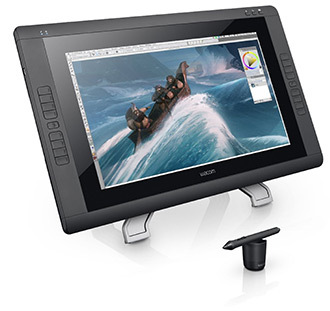 The Cintiq 22HD has a much larger design than the UG-2150 and it comes with far more features. The internal hardware is also made to last. 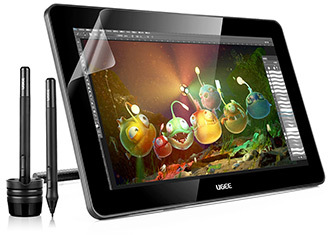 As a whole Wacom is considered a true professional’s artist tablet. Somehow Wacom got this tablet down to only two inches thick on the sides. This is over 50% thinner than the Ugee by comparison and it has a much larger display. 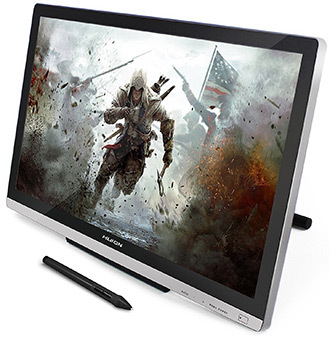 All Cintiq display tablets have a 1080p resolution with brilliant screen quality. The 22HD model is huge and it comes with a whopping 16 express keys that are fully programmable from your computer. These can work in any digital painting software and the Wacom drivers work for Windows and Mac computers. 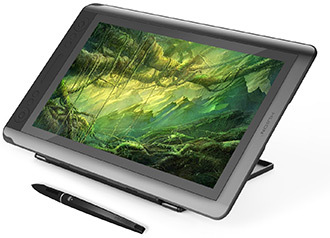 The Cintiq comes with a brand name Wacom stylus pen that runs battery-free and even connects to the tablet via bluetooth. As you hover different areas of the screen you’ll notice the mouse moves to adapt. And the Cintiq display screens are far more accurate than the Wacom Intuos line of tablets. So you will absolutely have a better drawing/painting experience on the 22HD if you go this route. It runs cool too so the display will never really feel hot under your hand. Plus it comes with a handy stand to adjust the tilting angle of the tablet. Everything you need is included in the box along with replacement nibs for the stylus and video connector cables. The biggest downside here is the price tag. It is a top of the line display tablet and you really can’t get much better than this. But if you’re willing to shell out the dough you will fall in love instantly. Bottom Line: The Cintiq 22HD is a beast and it’s what many professional artists use for their work. The drawing area is 1.5 feet wide and feels incredibly smooth under your hand. If you can eat the price you’ll have a powerful tablet that can run strong for years. If you’d prefer to go with a smaller display tablet then the best step down would be the Cintiq 13HD. It comes with many of the same features you find in the 22HD, but they run on a smaller device that can even be portable. Again the 13HD comes with a crystal-clear screen display using a satin-style finish for simple drawing. The active drawing area measures about 12″(one foot) wide by 6.75″ tall. This is definitely a lot smaller than most tablets in this guide. However it is possible to create stunning concept art even on a smaller screen. But you’ll want a quality tablet that can detect input over the entire drawing surface. Since this is a smaller unit you’ll only get four express keys. But this sacrifice might be worthwhile if you need a portable tablet. One potential downside is the tablet’s lack of friction while lying flat. While the 13HD stand does have rubber feet, the actual tablet does not. So if you lay the tablet flat on your desk you’ll need to make sure it’s positioned well or it can accidentally move in any direction. If you hold the tablet or work in your lap this won’t be an issue. And the stand it fantastic so there’s no reason not to use it! This is one of the best tablets you can get for this size and it’s brilliant for concept art. 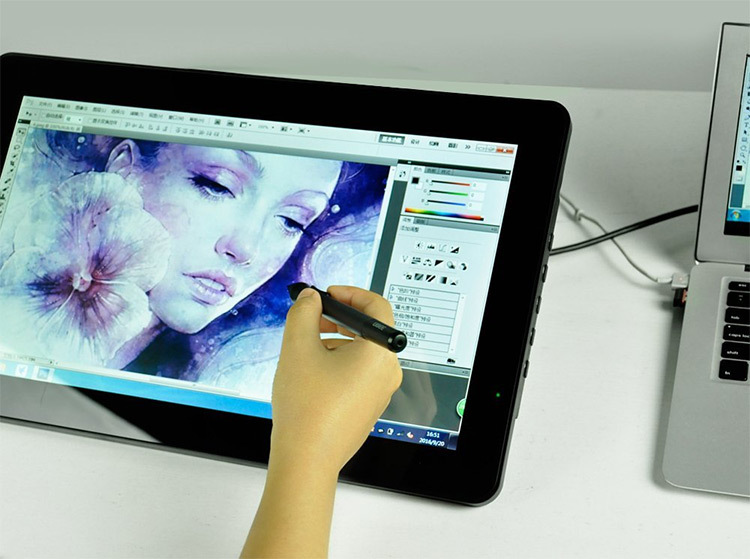 Bottom Line: If you want a portable display tablet then the Cintiq 13HD is your best choice. It’s lightweight, sturdy, and built to the best specifications you can get from Wacom’s display tablet lineup. Getting back to the larger display monitors we have the XP-Pen Artist22 which measures a full 21.5″ diagonal HD display. This uses a 1080p resolution and a 9-point calibration so it’s incredibly accurate. All XP-Pen devices tend to be on the better side when it comes to durability and drawing experience. Even their cheaper models hold up for a while. So the Artist22 is a great choice if you know you’ll be using it for the long haul. This tablet comes with a stand built into the back that you can unfold to varying degrees. It uses strong rubber legs spread horizontally so it covers a wider base. This limits shaking or any mobility while in use. Bottom Line: Grab the Artist22 if you like the design and can live without any express keys. This tablet is huge and it’s a little smaller/lighter than the UG-2150. They’re both very comparable models so if you have a brand preference then go with this one. Everything about the Monoprice 22″ tablet screams professionalism on a budget. We did a full detailed review of this tablet if you want to learn more. It has similar specs as other display tablets I mention in this post. However the MP-22 comes with a battery-free pen and has more flexibility in the stand. Somehow the guys/gals at Monoprice got this unit down to only 6 lbs. That’s pretty light considering it’s about the same size as every other 22″ display. The stand can be adjusted at intervals of about 5-10° with a minimum tilt of 20° to a max of about 85°(almost completely upright). One thing I like about the build is how the cable inputs and buttons are all found on the side. Many similar tablets have this stuff at the bottom which I don’t personally like, although everyone has their preferences. The MP-22 does not have any hot key buttons so it’s in the same park as others from Ugee and XP-Pen. But the battery free stylus really sets this one apart from the herd. It works well and the screen detects every mark lightning fast. Calibration is surprisingly simple with only four spots during setup. The default pressure settings should be more than sensitive enough to notice even slight differences when pressing down on the surface. In fact this really outperforms in all areas from design to surface materials and sensitivity while drawing. The biggest downside is the poor driver support for older OS’, and the lack of detailed settings from the driver software. But if you just need a display tablet that works in common programs like Photoshop then this tablet will exceed your expectations. Bottom Line: The MP-22 is great for artists who want a simple setup and a quality display. However it’s best for artists using newer operating systems for Mac & Windows, and using popular painting software like Photoshop or Corel. It can work with others but you might need to fiddle with driver settings. One of my favorite displays in this entire list is the Parblo Coast22 complete with stand, battery-free pen, screen protector, cleaning kit, artist glove and monitor cover. To learn more about operational setup & drawing read through our full review of the Coast22. Needless to say this thing performs well and pricing is reasonable so it’s right in that sweet spot for a large 21.5″ display. Screen quality is always a concern but Parblo does it right. Color settings are crisp right from first install and you have plenty of options to customize these features if needed. This screen is super smooth and it doesn’t really have any texture. If you prefer more texture then a Cintiq would be a better choice, although most artists can adjust to the smoother screen with time. Since the pen is battery-free you’ll never need to charge it. But if you’ve never used a battery free pen before then it can take some adjusting. One other nice feature is the pen button which replicates a right click on your mouse. But the button is sturdy so you won’t find yourself pushing it by accident. 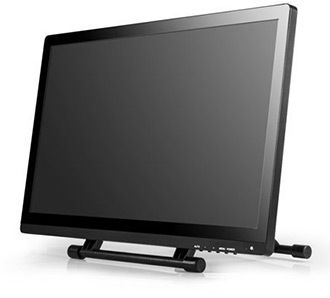 The monitor comes with a built-in stand that can swivel from a low of 10° up to a high point very close to 90° upright. The Coast22 might have the most flexible stand out of all these 21.5″ tablets. All cables stick out the side so you shouldn’t have trouble getting this down flatter on the table. Some users might not like the smooth display surface, and unfortunately the screen protector doesn’t help at all. But I can’t complain aside from the smooth screen and the lack of express keys(like other models). The price is good, the size is great, and it should work well for all major operating systems. Bottom Line: Pick up a Coast22 if you’re a fan of Parblo, or if you like the design and want a long-lasting display tablet. The stand is incredibly sturdy and you’ll never feel nervous applying pressure. The screen is smooth and slick so it’ll take time to adjust. But if you can live with that you’ll be happy drawing on the Coast22 daily. If you need a crystal clear display at a cheaper price then the Ugee HK 1560 should fit in well. The active drawing area measures almost 16″ in width and the screen is clear enough to see from any viewing angle(no glare). Ugee knocked it out of the park with this tablet and it’s one of their newest models. They’ve designed an incredibly crisp screen, improved the internal hardware, and created an offer with so many goodies that it’s hard to resist. The HK1560 is designed for all artists and can support lefties and righties alike. 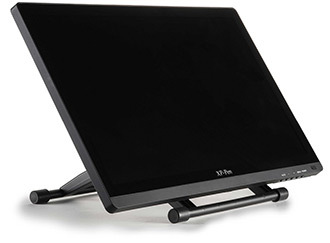 The screen is designed with anti-glare coating to let you draw from any angle. I still find the reflective light to be a tad annoying in some positions, but you can tell the anti-glare coating makes a difference. Ugee still uses battery-operated pens for this model which seems crazy considering how much battery-free tech is available. But they are nice enough to include two pens so you can swap when one loses its charge. The worst thing about this tablet is all the cable management. It needs three different cables to operate: a USB cable for data transfer, an HDMI cable for video, and an AC adapter for power. All three come out the side so all the wires are grouped together. But clutter is the worst thing about any tablet. I don’t like having to manage two wires, let alone three. The best manufacturers like Wacom add 3-in-1 wires for all the cables. Granted this shouldn’t be a deal breaker but you should know you’ll have to deal with a lot of extra wires. This makes the HK1560 best suited for home office work where you can leave it plugged in most of the time. On the back you’ll find a plastic T-shaped stand with rubber legs. This holds up well under pressure but it does feel a bit cheap. You can adjust the angle to move from a low 20° tilt to a max of an 80° upright tilt. And for all these complaints about wires and cables this really is a beautiful machine. Ugee even includes a few freebies with the tablet: a screen protector, a stylus holder, and an anti-fouling artist glove. For the size and the price this is a very nice tablet. Given the choice myself I’d still go with the Ugee UG-2150 just for screen size but these models are comparable and both work very well. Bottom Line: Ugee makes great products and you can’t go wrong either way. The HK1560 display is crisp and super clean. It’s much lighter than other Ugee tablets but the screen is also a tad smaller. If you can put up with the messy wires and make room for this on your desk then it’ll do wonders for your digital artwork. Huion made a lot of improvements in the newest version of the Huion GT-220. It’s a lot faster and offers cleaner lines without any jitters or line breaks mid-streak. The specs on this tablet are very similar to all the other 21.5″ IPS tablets. But the biggest seller here is the new technology and smoother drawing experience in the v2 update of the GT-220. I have to say the newest update is a lot thinner, and it’s noticeable! I always worry when touchscreens are made thinner because they can feel more vulnerable. But the new GT-220 is just as firm as ever. The screen does use very smooth glass so your stylus will glide along. The GT-220 comes with a screen protector that you can use to keep the display clear of smudges too. And Huion includes an artist glove to further reduce screen damage, grease, oils, or smudges. One thing you should know is the screen glare can be blinding at times. This mostly occurs when the tablet lies in direct light from an overhead light or from a window on a sunny day. You can always adjust your position to avoid the glare, but it can be brutal especially in bright rooms. I’ve taken a liking to the glass style because it’s easy to adjust and the tilt feature is versatile enough to support many angles from 15° to 85°. But the glare can be enough to make this not worth the effort. Over time you get used to it but I would’ve liked a matte finish. The actual drawing experience is magical. The entire tablet base is really just a fullscreen drawing area so it’s spacious. There are no express keys but this is standard with most tablets of this size. And while leaning on the screen it’ll feel thick enough to support your weight without collapsing. Bottom Line: Excellent tablet for the design, price, and features in the v2 update. Screen glare can be a dealbreaker but if you can control lighting in the room then this tablet can fly and it’s large enough to paint any type of concept art. Another Huion model that I really like is the Huion KAMVAS GT-156HD. The display is a tad smaller so it can feel like a step down from the GT-220. However the GT-156HD actually comes with express keys along with two quick touchbars for radial settings like brush size. These express keys can transform your workflow making this a wonderful companion for modern digital painting. Looking at the specs you can’t see much of a difference from other 21.5″ screens. But this tablet stands out for its unique design and express keys. Also the GT-156HD only needs one cable input which simplifies wire management. You still need to plug in three different cables(USB, HDMI, and AC) but they’re all attached to that one input. Any display tablet with this feature already gets a +1 in my book. The entire drawing surface is coated with a super thin 15mm glass cover designed to reduce/eliminate glare. It has a slight frosted design but it doesn’t skew any colors on the screen. Much like other tablets in this style you can also adjust the back stand to move from completely flat to basically vertical off the table. The stand doesn’t feel like much but it’s a lot stronger than other stands found on comparable models. Overall the inputs are quick and accurate. The frosted screen has a bit of texture but it shouldn’t slow you down. The biggest feature is the anti-glare coating that place nice with indoor lighting. Also it’s worth noting that the newest edition comes with updated drivers and a new stylus that can hold a charge for well over a couple months. I was really hoping for a battery-free stylus but you can’t have everything. Bottom Line: The Huion GT-156HD is probably their best display tablet. It’s sleek, thin, and uses an anti-glare screen. Plus it’s built with the newest Huion drivers & their newest rechargeable pen that can last over 60 days without charging. The price is steeper on this one but if you like the design then it’s worth nabbing. 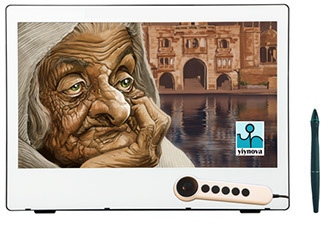 A diverse yet growing tablet for digital art is the Yiynova MVP22U. Not a pretty name but definitely a pretty tablet with some great features. The front screen measures almost the entire width of the tablet which hits about 18″ wide. It uses the 16:9 aspect ratio for a 1080p resolution and the front of the tablet is super clean. It’s also one of the few tablets that comes in white(if that’s important to you). This tablet is thin but heavy. It uses a full glass front cover and everything seems to fit as one unit. But the touchscreen is still sensitive enough to detect taps/curves anywhere on the surface. Surprisingly the sensitivity and accuracy of drawing on this tablet is better than most. It’s comparable to Wacom-style accuracy with fast update speeds that look instantaneous. The default sensitivity settings let you go super thin or really thick without spanning a wide range of pressure. In the box you’ll get two stylus pens which is great. However they’re both powered by AAA batteries which is basically the worst option(at least to me). However the pens work well and they do have a button to flip between pen/eraser mode. You’ll have to press hard to get it to register but it’s certainly usable. Maybe in the future they can switch to battery-free pens. Yiynova’s installation manual is one of the best coming from a landscape of East Asian tablet companies that don’t care much for proper English in their documentation. The installation should be a breeze and the drivers come with a settings menu for changing sensitivity & calibration. But the most unique feature here is the external express key remote that can be held and moved independently of the tablet. You can lie it flat, prop it upright, or keep it near your lap. The remote comes with 5 express keys and a radial dial wheel for changing gradations like opacity or brush size. This is the only external remote I’ve ever seen and it’s a unique design wholly engineered by Yiynova. I personally prefer the Wacom design over this because it’s more familiar. But if you can get used to this setup then you’ll have a blast working on this tablet. Bottom Line: The Yiynova MVP22U is functionally well made and very sensitive to stylus input. The screen is high quality with very smooth glass but I’m not thrilled with the AAA-powered battery pens. This is a unique tablet in a long line of copycats so if you’re willing to try something new then Yiynova will not disappoint. If you’re going off price alone then the Ugee HK1560 offers the cheapest solution with the best features for concept art. It can be used for all professional artwork because the screen quality is great and very smooth. It measures a full 21″ wide which should be enough for modern digital painting work. My biggest issue is the wire clutter. It comes with three separate wires(USB, HDMI, and AC power). They all have to be plugged in via separate cords rather than a 3-in-1 cord popularized by Wacom and other tablet brands. Ugee is generally great with wires but this particular unit can get messy. If you have enough space on your desk to feed the wires underneath & out of sight then this’ll make an excellent addition to your work space. It never heats up much and the screen is surprisingly sensitive. Unfortunately the stylus pen does need to be charged but Ugee sends two with each tablet so you can swap as needed. This also comes with a free screen protector and a Ugee drawing glove to reduce smudges. For such a large display tablet with so many features this is practically a bargain basement tablet. Yet it’s still powerful enough to produce incredible artwork with speed and accuracy. If you’re on a tight budget and still want a large display for digital painting then the HK1560 is a clear winner. As a long-time Wacom user I have to cast my vote that any Cintiq display tablet will give you the best bang for your buck. The 13HD is fairly small but it’s not too small for concept art. And it’ll last you a lifetime so it’s worth the investment. However I know their prices are A-list so they’re basically reserved for professional artists with jobs or practicing artists who feel okay spending on solid equipment. I think the Cintiq 22HD is even more worthwhile assuming you only want to work from home. It’s a powerful tablet and it’ll probably last you well over a decade. Their latest models are fantastic with newer hardware and even better styluses. Wacom is also the safest brand for non-techies who don’t want to risk dealing with a messy setup process. Most other tablets work fine as long as you have the newest version of Windows or OS X. But there have even been tablets that had issues with Windows 10 in the past. When you go with Wacom you know your money is going to a trustworthy brand. 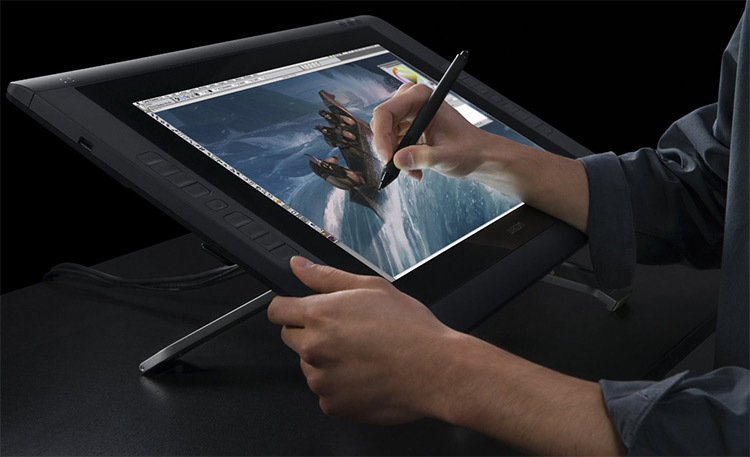 Professional studios from Naughty Dog to Nickelodeon use Wacom tablets. They’re the industry standard for a reason. The only disclaimer here is for hobbyists who pursue art for their own pleasure. The Cintiq is still a great choice, but it may be hard to justify dishing out that much from your bank account. 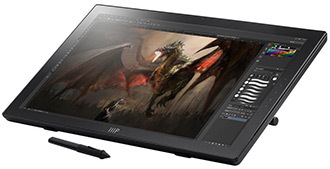 If the price tag doesn’t scare you and the Cintiq can fit on your desk then either the 13HD or the 22HD will offer a solid return on investment. This guide focuses on display tablets because they’re the absolute best for concept art. But you can choose a non-display tablet and still get far with concept art. It just won’t be as seamless of an experience. I still feel the Ugee UG-2150 is the overall best choice for the price, features, and size. It works well as a desktop companion and if you have the space then it can find a permanent home in your office or art studio. But never settle for something you don’t like. There are so many graphics tablets and they’re all built with different specs, styluses, screen styles and drivers. If you know exactly what you’re looking for then you’ll have a easier time picking a tablet for your concept art work. But any tablet from this guide is a sure thing and you can even compare to see which tablet(s) best fit your needs and budget constraints.